On PT Distinction your clients can add anything to their schedule, or move any pre scheduled item if you wish to allow it. Adding items to the schedule means your clients can easily keep you up to date with any extra training sessions or an additional activity they do in the week. This lets you know what they've done and gives an accurate timeline to look back on. Allowing your clients to move pre scheduled items around makes things a little bit more flexible for them. For example, if they've got a training session scheduled on a Sunday and they prefer to do it on the Saturday, they can just move it with no problems. Here's how you set it up to allow your clients to move scheduled items around, and how it all works from your clients point of view. To allow clients to move pre scheduled items, inside your trainer portal, click on Settings. In Settings, under “Allow Clients to Move Scheduled Items”, select Yes and then Save. 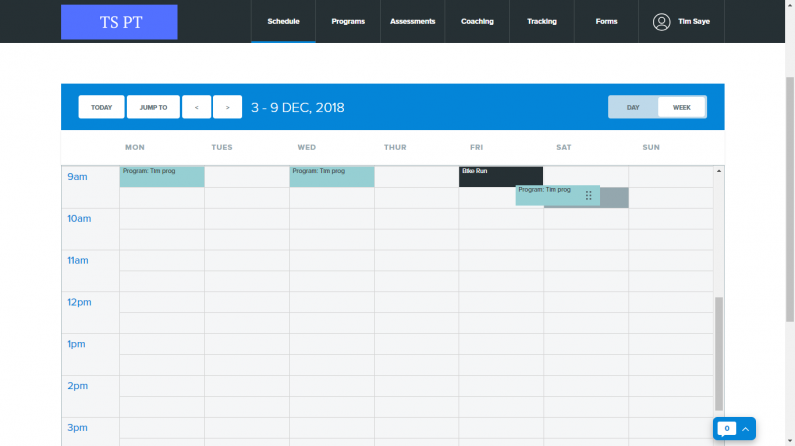 That is now set up so that your clients can move items in their schedule. From the clients side they login and select “My Schedule”. Inside their schedule, they'll see what they've got to do. If a client wants to move anything in their schedule they select the item and drag and drop. If they're on mobile, they click the item and select the option to move it. To add to their schedule clients click on Add a Note. Set the time, then title and write in any details they wish to add. Anything clients add or move will automatically update into their schedule inside your account as well. So you can check any details inside your trainer portal.